I concur with this statement that Google opens their blog post announcing a new tool they’ve developed called the Inactive Account Manager. 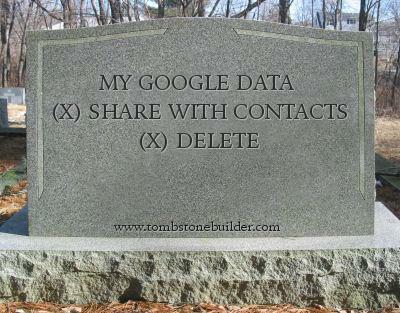 This tool is designed to let you assign people to access your data or delete it after you die. The way it works is that you setup a timeout period for signing in to your account which if exceeded will send an email (which you compose yourself) to “trusted contacts” (up to 10). 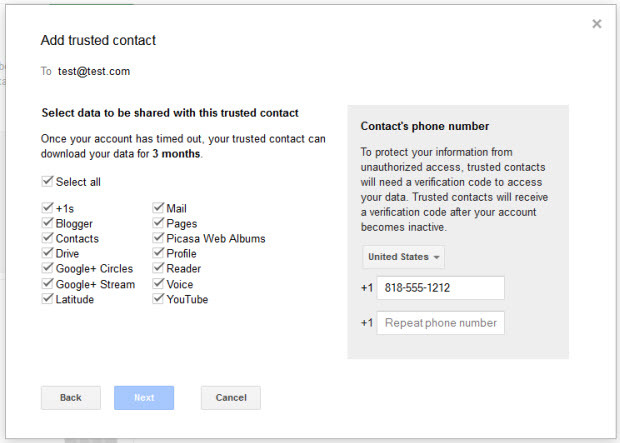 The email notifies them of your inactive status and grants them access to selected Google data if you choose. You also have the option of not assigning anyone and having Google delete your account and all of your data. The process begins based on a timeout period that you set for sign-ins (3-18 months). You will get an alert 1 month before the expiration date hits as a precaution as well. Here’s the screen for adding a trusted contact and selecting which data they can access. While having a tool such as this is good, every social service varies with regards to their policies and have different ways of providing access and what you can do with the data. Managing this across multiple services can be challenging. There are many stories of people that struggle gaining access to social services after a loved one passes. According to this story from last year there were only 5 states that had estate laws around digital assets last year. It’s definitely an issue with law catching up to technology and there will continue to be lots of issues and confusion until it matures. In lieu of this the government has even written a blog post encouraging people to create a social media will along with tips on how to do it. I agree that taking control over your wishes around digital data is very important. I’d recommend creating a legal document that lists your wishes with regards to online accounts and data and assign a “digital executor” with access to all of your online accounts to execute your wishes after you die. There are some great password tools and services out there like Lastpass and 1Password you can use to provide a single protected way of storing all of your login information. By having a document with your wishes and a single entry point with all of your login data you are taking a great step at preserving your wishes for data. You can learn more bout the importance of planning for your digital legacy at this dedicated section on the site for information on digital preservation. I like this option. Now I have to find someone worthy of keeping my spirit alive.